The heat of July is fully upon us. It’s getting harder to imagine a time when the air conditioner was turned off and the heat was on full, but it wasn’t too long ago, and now it’s not too far in the future. It’s time to think about how you’re going to heat your home this coming winter, and a RetroHeat floor heating system from Warmzone is one of the best radiant floor heating options available. RetroHeat is a cost-effective, easy-to-install product that is a great project for you to manage on your own. If you have clear open access to the floor joists of the room you would like to heat, then installing radiant heat is a snap. If you would love to add underfloor heating to a room but don’t want to destroy your beautiful home to do so, RetroHeat is the clear solution. A roll of RetroHeat paneling can add heat to a room that didn’t have it before, without ripping existing floor structures. Simply staple the heating panel between the floor joists, followed by a layer of insulation and ka-pow! You’ve got yourself a radiant heated floor. 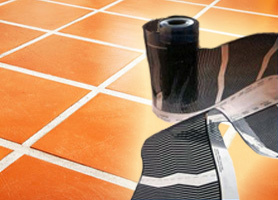 The RetroHeat floor heating system features a thin, film heating element that can be stapled up between floor joists to heat the existing floor above. Any type of floor can benefit from RetroHeat’s floor warming system. The carpet in your living room, the hardwood on your walkways, the tile in your kitchen; all of these are capable of being made more cozy with the RetroHeat floor heating system. A simple-to-understand heating thermostat gives you complete control over temperature and time release. If a RetroHeat project seems like the right fit, the unbiased experts at Warmzone are the most knowledgeable to work with, and they’ll help you design the system that will work best for you. Radiant floor heat is a great solution if you would rather not spend money on a new circulating air system. RetroHeat floor heating systems warm the ground beneath your feet rather than the air above your head. 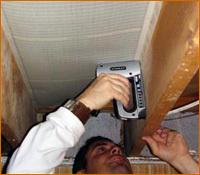 RetroHeat’s benefits aren’t only cost and ease of installation. The heating panels are energy efficient, thin and lightweight. No energy is wasted in heating air and then blowing it through the house; instead, the energy is directly transferred to your floors. Because of their unique installation, no floor buildup is necessary. Maybe there’s a room in your house that has always seemed colder than the others, or a late addition that didn’t get the same insulation as the rest of your house. Or maybe you want to warm your cold tile so that you can walk barefoot through your house in the winter. Whatever the issue, RetroHeat is an excellent floor heating solution. Questions? Call a radiant heat professional at 888.488.9276. More than a luxury, electric radiant heating systems are increasingly becoming part of the menu of products and services offered by hydronic and HVAC professionals. In 2010, hydronic and HVAC professionals were Warmzone’s top customers. The good news—whether you’re incorporating electric radiant heat into a new residential construction project, or embarking on a home improvement project, your chances of finding a Warmzone partner are just a phone call away. Why are HVAC and hydronic professionals partnering with Warmzone? Warmzone is committed to the success of commercial contractors and customers, and strives to offer the best radiant products, plus professionals who can help with all of the aspects of a project to make the sale and installation run as smoothly as possible. And just like the professionals, as a Warmzone customer you also have access to radiant heat designers, master electricians and hydronic specialists with the in-house expertise necessary to plan and execute just about any radiant heat project within your scope and budget. These heat experts have the most industry experience and the ability to provide non-biased radiant heat information based on your needs. The comfort, convenience and the technology behind radiant heat systems have helped to create the perception of luxury and exclusivity. Why not put this perception to good use for your next home improvement project by investing in electric radiant heat? It’s a unique selling point, an impressive comfort and convenience feature, and a potential equity booster for homeowners. More than a little luxury, radiant heat is becoming a homeowner’s necessity in today’s economy. You’ll be surprised (and pleased) to discover how efficient, from an operational standpoint, and how truly affordable these systems really are. For a small initial investment, the cost and convenience of electric radiant heat can really pay off in the long term. Electric radiant heat is becoming a mainstay in world of hydronic and HVAC technology because it provides a safer, cleaner, greener alternative to traditional systems. It derives its power from electricity rather than costly fossil fuels. With the help of sensors and a zone-specific thermostat, radiant heat enables homeowners to selectively heat rooms quickly, where it’s needed most, and realize an energy savings in rooms where it isn’t. Unlike forced air systems, radiant heat radiates up through the floor and objects to warm a room. It’s quick, efficient and instantaneous. There’s no hot air or air ducts involved, so there’s no blowing allergens and other contaminates to compromise air quality, making radiant heat a safer choice for home environments. Warmzone has many products to fill many heating needs. Call an expert today at 888.488.9276 for help designing a floor heating or snow melting system, to buy products, or just to learn more about radiant heat.